This week we’ve got a single new Diablo III wallpaper. 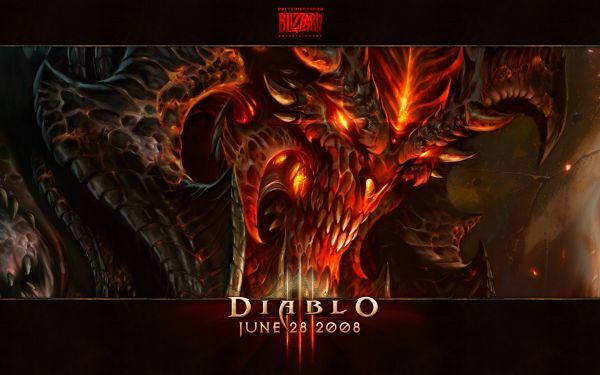 It’s one Holyknight3000 created for the third anniversary of Diablo III’s announcement, and it’s a great view of a closeup of Big Red’s snarling face; original artwork by Glowei. A excerpt from his caption is below; click the image to get it at desktop size, and in your choice of resolution sizes. You never know what you can find on Google. Yep that’s where I found this super high quality image of big red. Since I was lacking a new headshot and I thought when i found this super size version of this image I had to do it. Its such a nice simple wallpaper I love it to death. The date below the logo I still mark for the reveal date anniversary. If anyone wants the undated version of this let me know I’ll post it up. And sorry this was delayed a few days I was terribly busy this week. I hope you all like. My personal 3 year and FRS 3 years will be coming up in the next couple weeks. See you then!